Fast, dextrous guitar playing can sometimes be great, but with the right effects, you can get some amazing results by playing just one note or two notes. 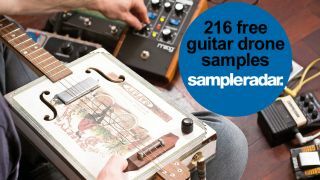 Created with a range of guitars, amps, pedals and other outboard and software processors, SampleRadar's selection of 2-bar drones can be used as they are or manipulated even further. The guitar drone samples are divided into six folders, each of which is labelled according to the tempo of the sounds contained within it. The guitar drone samples are supplied in a zip file, so you'll need to extract them before you can see them. Enjoy!